I am definitely partial to a bit of chocolate well I guess we all are and I absolutely love Thornton's there one of my favourites amongst the chocolate world. I was asked if I would like to review a few of their products for valentines day and of course we agree! Thornton's are never sure to disappoint whether its a birthday gift, occasion gift like valentines day, or a gift just to say I love you there is something for everyone to enjoy. For valentines day we were sent two of there gift ideas to try out and review the first was the little chocolate love bird and the second was the I love you chocolate cups. 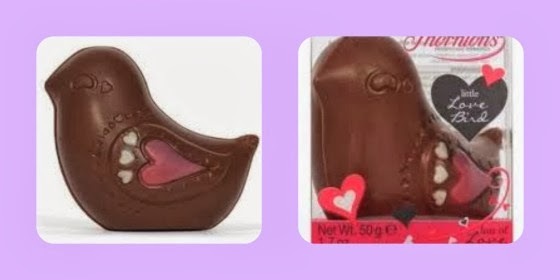 The chocolate love bird is hollow milk chocolate with a lovely red heart on the side of it, even though the bird is hollow the chocolate is really thick, thicker than you would think and of course with the luxury of it being creamy and divine as are all Thornton's chocolate. The chocolate bird is priced at just £1.99 and is great value for money it would make a great last minute gift or accompaniment to another gift, it would even be great on its own. The chocolate cups come in a beautifully presented box, the chocolates consist of three milk and white chocolate truffles and the heart is a triple later solid chocolate I loved every single one of these chocolates with the heart being my favourite again the smooth chocolate is divine. 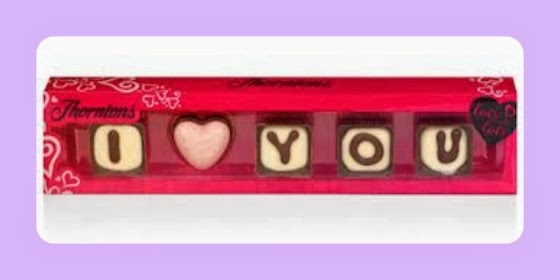 The chocolates are priced at £3.49 - a bargain and the three little words say it all. These beautiful chocolates were sent to me for the purpose of this review all opinions expressed are honest and my own.